I have written about this probably nearly every year, so I do not want to belabor the subject too much. Many have misunderstood me on this, and have even ‘un-friended’ me, because the history I point out seems to be a personal offense, I suppose, even though I usually preface these things with my purpose, which is never to offend, but only to provoke thought and explain my walk to ‘old friends’ and new. This year, however, I simply want to focus on what this whole season means to me. I desire truth. Nothing more, nothing less. Even as a child I figured out that our Messiah was not born during this season; there were shepherds ‘abiding in the field’ on the very night of Messiah’s birth. One just does not do that in the dead of winter. [Yes, it snows in Bethlehem almost every year in late December]. But, like most people, I overlooked the anomaly and celebrated His birth any way. As a married adult, however, with my wife, I decided that we would not impose the figurehead of this ‘winter holiday’ on our children. One reason for me was that the revelation that there was no S.C. was rather traumatic for me at four years old: my uncle Billy went out on the back porch and pretended to shoot Rudolph and the ‘great elf,’ on the eve of his supposed arrival. I went to bed crying and worried. That, along with discovering the origins of many ‘extra’ customs associated, caused me to want only to teach my children truth. One year, when they were quite young, we bought into the idea of treating that day like a ‘birthday,’ cake and all…. For our kids…. And it just did not sit well with me, knowing Yeshua was not born on that day. Further research revealed to me that several pagan deities were born on that day, 12/25. I chose no longer to participate, having learned by then that Yeshua was born during Sukkot, “Tabernacles,” the seventh feast that G-d Himself ordained for all mankind. It took Melly a few years to ‘see’ it, but she did, and so we began only to observe Khannukah during this season. And Khannukah precedes today’s version of this biggest holiday, historically. Many think that G-d does not honor this eight-day season. No, He did not directly command its observance. But, neither did He directly command observing Purim, though Esther, Mordechai, and all Yisra’el did, and still do. It is indeed, like Khannukah, a ‘custom’ instituted by Yisra’el. Khannukah would be in a similar category, then, as Purim. But, interestingly, it is ONLY the Brit Khadashah [Renewed Covenant] Scriptures that mention Khannukah! Jews [who do not believe in Messiah] celebrate it, but it is not mentioned in their holy books! And they are completely unaware that Messiah Yeshua was conceived during this time! Christians do not celebrate it, but instead celebrate a birth that did not occur at this time [on the highest day of ‘birth’ of most pagan religions]! Birth is not so much the miracle of Yeshua as is His conception! He was MIRACULOUSLY CONCEIVED! He is the ONLY man ever born of the WILL of G-d, by His Ruakh [Spirit], and not by the will and passion of man. That is far greater a miracle than any birth! All of us were born in the same fashion as Yeshua, and some are born into worse circumstances than being born in a Sukka [a temporary home built by Jews in the fall for the feast of Sukkot]. But NONE of us are born of the very Ruakh of G-d; no one else can claim the Creator as His direct progenitor in that fashion. This is the darkest time of the year. And Yeshua is “The Light of the World.” That light was kindled the moment He was conceived, and His cousin recognized Him when they were both in close proximity to one another, and still in the womb. Yeshua was very recently conceived at that memorable moment. His ‘light’ was already shining. The connection of Khannukah to Sukkot is obvious, and historical. It is a miracle that there was ‘kosher’ oil to put into the Menorah. History tells us that they celebrated for eight days when the Menorah was lit for the first time after nearly six years of spiritual ‘darkness’ in Yisra’el. The Menorah is the first ‘rite’ of Temple worship, and must be lit before anything else goes on in the sanctuary. The House of G-d had been desecrated by a ‘false Messiah,’ Antiochus, and needed again to be dedicated, after the Maccabees had driven the Greeks out of the Temple, and out of the land, by force. That, too, was a miracle, as the Maccabees were shepherd/priests, misfits according to military standards, and far outnumbered. G-d had helped them to overcome the oppressor. The Temple is supposed to be pure. There are not supposed to be other gods in it; their names are not even supposed to be mentioned! Antiochus had called himself “god,” and had offered a pig on the altar, and had erected a statue of Zeus and said “Hail [praise] Zeus,” in the House of G-d. The Temple was defiled. Not only so, but he forbade Jews to keep the Sabbath and the other feasts, to circumcise their sons, to study Torah, to teach Torah to their kids, and even to speak Hebrew! This is what angered Yehudah Maccabee, and set his family on fire, trusting G-d that they could defeat the Greeks and restore the feasts and the study of Torah to Israel. The customs of Khannukah commemorate these events. One commemorates the survival of the study of Torah. The ‘Dreidel’ is a ‘top’ that has four letters on it: Nun, Gimel, Heh, Shin. They stand for the phrase, ‘Nes Gadol Hayah Sham,’ ‘A Great Miracle Happened There!’ [In Israel, it is Nes Gadol Hayah Po, A Great Miracle Happened Here!] This game is played to commemorate Jewish attempts to teach their kids Torah and Hebrew anyway, in secret. The word ‘dreidel’ means ‘turning,’ and is the same German root of one of my grandmother’s names: Dreyer [turner]. So I especially like playing Dreidels and winning Gelt [chocolate money]. Eating latkes and sufganyot [potato pancakes and doughnuts] commemorates the miracle of having oil. In fact, most food is fried in oil during Khannukah. This commemorates the availability of oil to light the Menorah in the Temple. Lighting the Khannukiah is, of course, the most obvious and cherished tradition. In the time of Messiah, it was a small, eight-wicked lamp, commemorating the eight days of celebrating the ‘Dedication’ that happened in the heart of winter [John 10]. The lamp was placed in the window so passers-by could be reminded of the miracle. 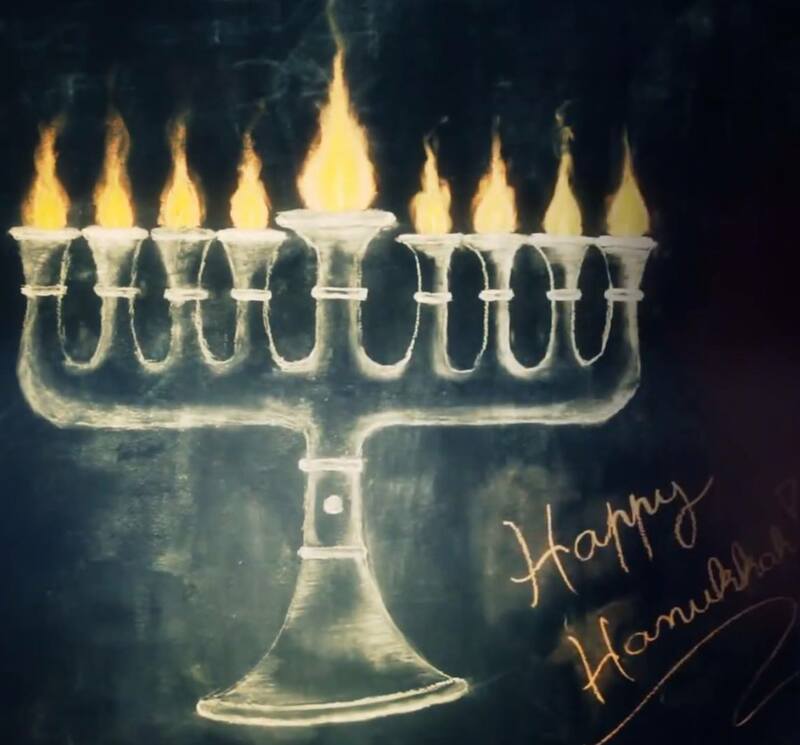 These days, there is an additional lamp on the Khannukiah [Khannukah Menorah; THE Menorah has Seven Lamps, Revelation 4]. This also comes from the Ashkenazi community of Jews in Germany [my heritage on both my mother’s and my father’s sides], where the ninth lamp was added to silver Khannukiahs by accident. Instead of discarding them, they called the ninth light a ‘Shammash,” or ‘servant’ candle, and used it to light all the other lights each night! There could be no better picture of Yeshua! He is the one who ‘walks among the candles,’ [Rev 1-2]. He IS our light! תִּכּוֹן בֵּית תְּפִלָּתִי, וְשָׁם תּוֹדָה נְזַבֵּחַ. אָז אֶגְמוֹר בְּשִׁיר מִזְמוֹר חֲנֻכַּת הַמִּזְבֵּחַ. Ma’oz Tzur Yeshu’ati, lekha na’eh leshabe’ah. Tikon beit tefilati, vesham toda nezabe’ah. Le’et takhin matbe’ah mitzar hamnabe’ah. Az egmor beshir mizmor hanukat hamizbe’ah. My refuge, my rock of salvation! ‘Tis pleasant to sing your praises. Let our house of prayer be restored. And there we will offer you our thanks. When You will have slaughtered the tormenting foe. Then we will celebrate with song and psalm the altar’s dedication.